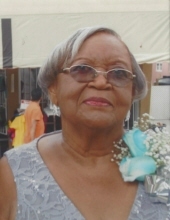 Eileen Gwendolyn Lloyd, 83, of St. Thomas, died, Wednesday, March 28, 2018, in Atlanta, GA.
To plant a tree in memory of Eileen Gwendolyn Lloyd, please visit our Tribute Store. Viewing will begin at 9:00am at the church to be followed by the service at 10:00am. "Email Address" would like to share the life celebration of Eileen Gwendolyn Lloyd. Click on the "link" to go to share a favorite memory or leave a condolence message for the family.